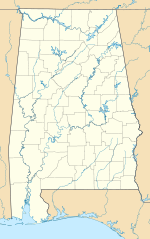 Headland Municipal Airport (FAA LID: 0J6) is a city-owned, public-use airport located two nautical miles (4 km) northeast of the central business district of Headland, a city in Henry County, Alabama, United States. Headland Municipal Airport covers an area of 328 acres (133 ha) at an elevation of 359 feet (109 m) above mean sea level. It has two runways: 9/27 is 5,002 by 80 feet (1,525 x 24 m) with an asphalt pavement and 17/35 is 2,865 by 162 feet (873 x 49 m) with a turf surface. For the 12-month period ending November 5, 2010, the airport had 41,203 aircraft operations, an average of 112 per day: 90% general aviation and 10% military. At that time there were 30 aircraft based at this airport: 93% single-engine and 7% multi-engine. ^ a b c d FAA Airport Master Record for 0J6 (Form 5010 PDF). Federal Aviation Administration. Effective 25 August 2011.